Fight, Flight, Freeze or Fawn? Now, returning to the UK as Ellen Newman, she moves to a small coastal village, working as a nanny for Donovan, a criminal psychologist. Attractive, caring and protective, this single father and his sweet daughter are a world away from Ellen’s past. She thinks she’s escaped. She thinks she’s safe. But something is wrong. Strange incidents begin to plague her new family, and their house of calm is about to become one of suspicion and fear. Who can be trusted? Who is the target? Who is closing in? 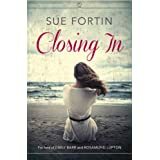 I am delighted to be part of Fiction Addiction's Book Tour for Sue Fortin's second novel, Closing In. Very different to her debut novel, United States of Love, this is a fast paced page turner with plenty of twists and turns along the way. Following the story of Helen, who is running from the past , the author brings us on a journey of new beginnings, new friendships and second chances. Donovan is a strong character who, despite circumstances, gives Helen the stability she needs and makes her feel alive again. The chemistry between them is great and I can certainly see why Helen would be attracted to him. The bag had been hidden at the back of the loft for several weeks now. Packed and ready to go. Helen checked the contents. The all-important papers were there. Deed poll, change of name. New bank account. New bank card. New passport. She ran her finger over the gold embossed coat of arms of the little red book before flicking through the green pages, pausing at the photograph. The face that had stared back at her all these years was the same; shoulder length blonde hair, hazel eyes and fair complexion but the name betrayed the picture. Helen Matthews was no more. Toby didn’t miss the guarded note in Kate’s voice. She wasn’t going to tell him anything. He took a deep breath and forced a conciliatory tone. ‘I don’t even know why she took off. I got back from a weekend away clay pigeon shooting and found a note. I’m worried about her. That’s all. Please, Kate?’ Jesus, was he going to have to beg? ‘Thanks. I really appreciate it. I feel lost without her.’ Finishing the call he dropped his phone on to the sofa and picked up the note Helen had left. P.S. Please remember to feed Scruffs. I’ve stocked the cupboard up with cat food so you don’t need to buy any more for at least a week. He looked at Scruffs stretched out on the sofa next to him. Toby reached over and ran his fingers up and down the cat’s neck. He could feel all the tiny bones of its skeleton beneath the fur and skin. Scrawny little thing. Helen adored that cat and, yet, she had left it. This was all so out of character for her. Running out on him, on the cat, on their life together. It was the last thing he thought she would do. How had he not seen this coming and where in God’s name could she have gone? He was sure Kate knew. In fact, he’d stake his Square Mile bankers’ salary on it. Scooping the cat up, Toby continued to stroke the tortoiseshell fur as he walked over to the full length window. He stood looking out over the Islington skyline. His finger and thumb massaged the back of the cat’s neck, before sliding all the way around, meeting under its chin. Thank you for the review. So glad you enjoyed it and I'm very flattered for the 'fans of' comment. You are most welcome Sue.....It was a great read!! Fabulous review Margaret! So glad you enjoyed Closing In. Thank you for supporting Sue on tour. This sounds like such a great book! I'd love to read it and have put it on my wish list straight away!